MIM: Boko Haram is tied to Al Qaeda. The BBC article doesnt mention either group nor use the word Islamist. Instead it describes them as"gunmen" and states that "masked men were standing behind them in the footage". (see picture below). A Briton and an Italian abducted by gunmen in Nigeria last year have died in a failed rescue attempt, UK Prime Minister David Cameron has announced. He said it appeared Chris McManus - from north-west England - and Franco Lamolinara had been "murdered by their captors before they could be rescued". British forces supported the Nigerian-led operation, Mr Cameron said. Mr Cameron said authorities had decided to go ahead with the rescue operation after receiving "credible information about [the men's] location". "A window of opportunity arose to secure their release. We also had reason to believe that their lives were under imminent and growing danger," he said. The prime minister said it was "with great regret" that he had to announce that Mr McManus and Mr Lamolinara had lost their lives in the subsequent operation. Mr Cameron offered his condolences to the two men's families. "Both families have endured a terrible ordeal, and this is a devastating moment for all of them," he said. He thanked the Nigerian authorities and Nigerian President Goodluck Jonathan for all they had done to find Mr McManus and "combat terrorism". "I also want to pay tribute to all those, including UK personnel, who worked so hard to try to bring Chris home safely," Mr Cameron said. "I am very sorry that this ended so tragically. Terrorism and appalling crimes such as these are a scourge on our world." Mr Jonathan said that the men's captors had been seized. Mr McManus's family released a statement saying they were "devastated" by his death but thanked those who had worked to try to free him. "During this ordeal we have relied heavily on the support of our family and friends which has never waned and has enabled us to get through the most difficult of times," they said. "We are also aware of the many people who were working to try and have Chris returned to our family, and his girlfriend. We would like to thank all of them for their efforts. The family said their thoughts were also with Mr Lamolinara's loved ones and asked that their privacy be respected. The Italian government said Mr Cameron had phoned his Italian counterpart to give him the news. A statement from the office of Italian Prime Minister Mario Monti said Mr Lamolinara was from the small northern town of Gattinara, in Piedmont, but was understood to have worked in West Africa for a number of years. Mr Lamolinara and Mr McManus had been involved in the construction of the state headquarters for the Central Bank of Nigeria. They had been working for B Stabilini, an Italian construction firm based in the Nigerian capital, Abuja, when they were kidnapped. Another Italian employee managed to escape during the kidnapping but a Nigerian neighbour who came to help was shot and wounded. 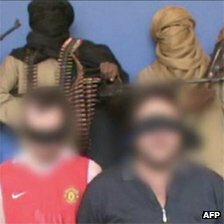 BBC political correspondent Carole Walker says the Foreign Office had been working behind the scenes to try to secure the men's release. Mark Lobel, reporting for the BBC from Lagos, said eye witnesses had told him the house where the two men had been held was still surrounded by military and appeared to be on fire. She says a video was released to news media last year that appeared to show the men blindfolded with their arms behind them. Masked men were standing behind them in the footage.